To be the best at what you do, you need access to the most current industry information and the ability to make meaningful professional connections.  AMA Puget Sound gives you the edge with top-of-the-line programming, relevant news and trends, and the largest membership of any marketing organization in the state. When addressing the issue of customer insight, many marketers have felt that the answer lies in one direction - Big Data. There is no question that data is important, but it's what you do with the data that really matters in marketing. The AMA Puget Sound Healthcare Special Interest Group was formed in 2009 to provide an outlet for marketers with similar interests to interact and share ideas, knowledge, insights and best practices that are specific to the healthcare industry. The AMA Puget Sound South Sound Special Interest Group was formed in 2011 to provide an opportunity for marketing professionals in the South Sound area to interact and share ideas, knowledge, insights and best practices. The mission of AMA Puget Sound Collegiate Relations is simple: to supply Puget Sound area college students who desire careers in marketing with the information, community and local job market support they need. The AMA Puget Sound Mentor Program is designed to serve both the personal and professional growth of our members and stimulate a culture of life-long learning for our future marketing leaders. The program connects experienced marketing professionals with aspiring professionals in a supportive environment to share knowledge, wisdom, and real-world industry experience. Check out our new job placement services. At 500 members strong, AMA Puget Sound offers marketers at all levels the opportunity to learn, grow and support one another.